Betcha didn't know that you could use snow to frost a graham cracker? 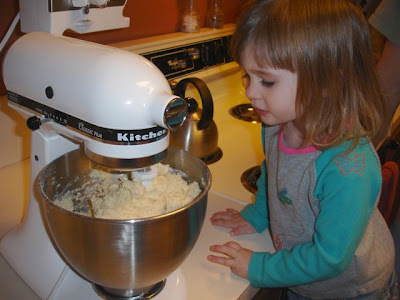 We might have another baker in the house. Or maybe just another sweet tooth. Bea comes running when she hears the KitchenAid mixer going. 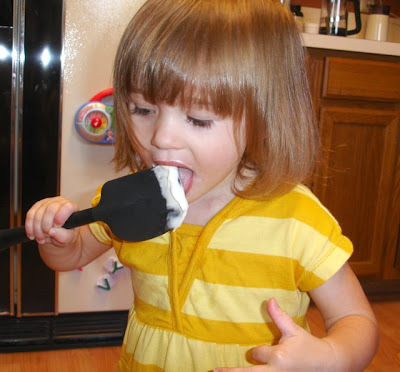 And she already knows to ask for a spatula to lick. Yummy mommy! 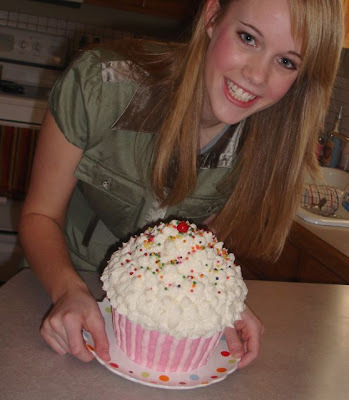 My niece, Alyssa Peppiatt, turned 17 last Friday, and since we were going to Salina this weekend to visit my mom, I baked her one of my favorite, giant cupcake cakes. 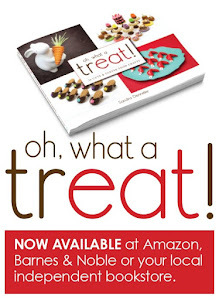 Sweet treats for a sweet niece – love ya darlin'! I tell you what, this cake pan rocks! It's so easy to make and it looks awesome every time. I highly recommend it. I got mine at Target, but you can find them at Amazon.com too. 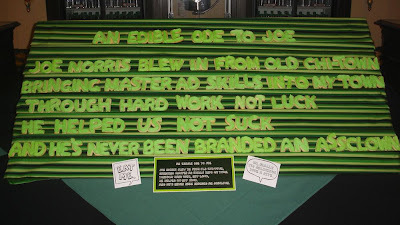 An Edible Ode to Joe. 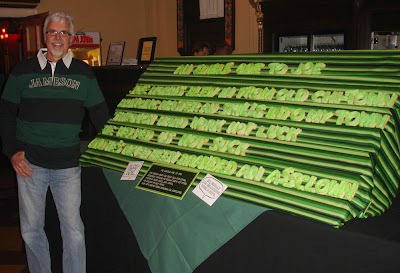 Of course, Eric got roped into my craziness and had to build a special display board for the cookies. And he graciously offered to help me set everything up - keeping me calm when I realized, 45-minutes before the party started, that I'd forgotten to bake a freakin' word! It all worked out just fine though. Thank you, dear. Many years ago, Joe once called me "Betty Crocker on Acid." So I couldn't let him retire without proving him right. Best wishes to a truly great, great guy. May your retirement years be sweet. 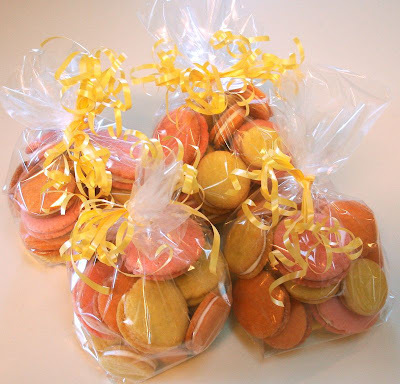 I have a new baking obsession: french macarons. (Think mini-moonpie, but crunchier - and much more complicated.) 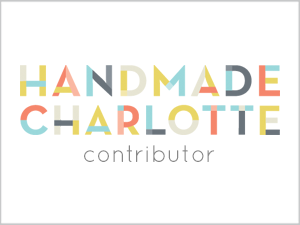 A few weeks ago my brother-in-law informed me that, "macarons are the new cupcake." He read about them in a magazine somewhere, so of course I was intrigued. Over the Christmas break, I Googled all kinds of information on these adorable, fabulously-colored, sandwich-like cookies. And I desperately wanted to bake them. But in the City of Wichita, with a population of 350,000, do you think I could find the almond flour that all the recipes call for? Nope. Nada. Zilch. WTF? I think I may have finally tracked some down at the Whole Foods on Central, but in the mean time, I really wanted to try and make these pint-sized, party pastries. So I used my Kansas Sugar Cookie recipe and my buttercream icing recipe, and made my version of a french macaron: Sandywiches. They're good, they're cute, but they're TOO sweet. (...yes, you heard me say it, TOO SWEET, even for me.) 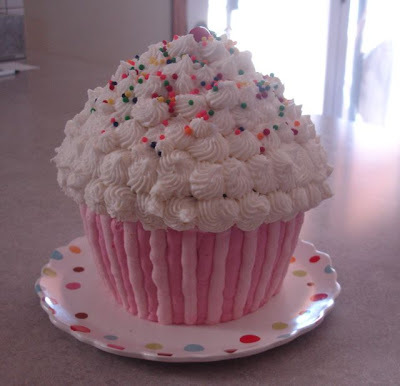 But now that I know where to get that elusive almond flour, you can be sure I'm going to make another attempt. Stay tuned. Two weeks before Christmas, Eric decided to build a play kitchen for Bea. 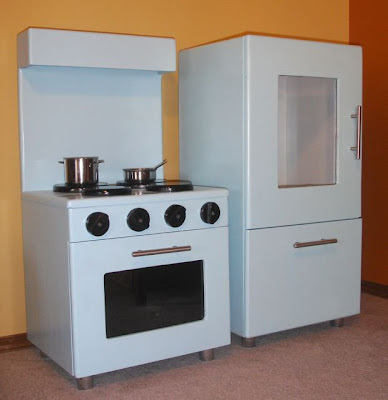 He settled on this fun, little retro-blue design with chrome handles and legs. There's glass on the doors and even a crisper drawer in the fridge. So far, Bea has cooked for us: Pluto the Dog au Gratin, Boots the Monkey Souffle, and other assorted stuffed animal delicacies. Yes, apparently we need to get the girl some pretend food to work with. 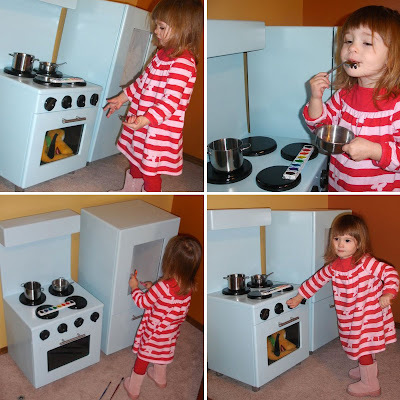 We hope she has many happy memories cooking her kid cuisine in the kitchen that daddy built.